The alarm went off at 3:30 am and with the van packed the night before, by 4 am I was on the road from Bristol to Bournemouth for a days chub fishing. In the weeks running up to my visit, I’d eagerly watched the river levels and was excited to see them dropping to a perfect level for long trotting. 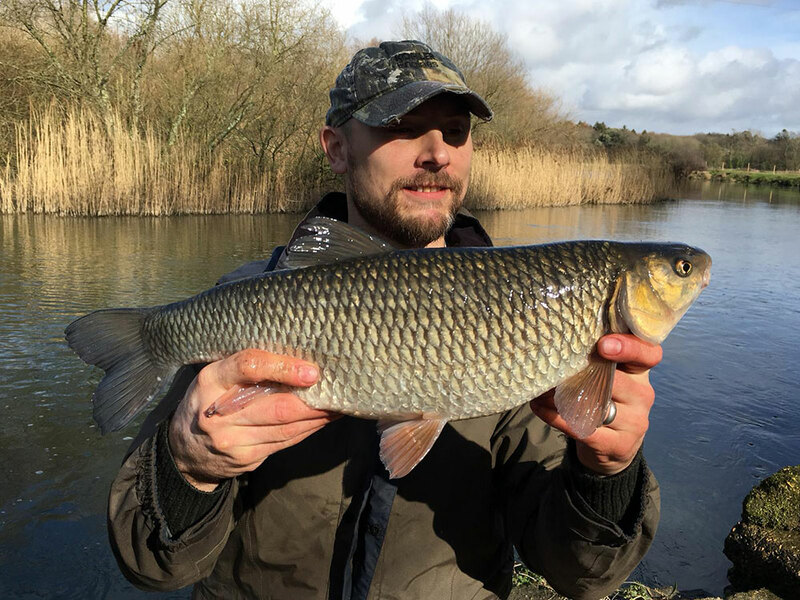 The weather was very kind too and despite there being scattered showers throughout the day, there wasn’t a breath of wind which meant presenting a float to these large, wary and heavily fished for chub in the clear water of the Dorset Stour would be a much easier task. Given that the Stour is not my home venue, I really benefited from some local knowledge and liaising with a friend who has fished the river all his life indulged me with information regarding the current hotspots and where best to fish. I arrived at the river just after first light and was pleased to see my early alarm call had paid off and the ‘in form’ peg was all mine for the day. The first thing I did was look at the peg and figure out where and how to fish it. I was on the outside of a bend, and the flow was concentrated on my bank forming an inviting crease with the slower water on the inside of the bend. I opened my bucket containing two gallons of red maggots and began feeding the line I intended to fish as I set up my tackle. A quick plumb of the peg revealed it to be around 8 feet deep, so I opted to fish with a 4g Dave Harrell No1 Alloy Stem Avon float. This Float has a nice buoyant body and a very large tip which is perfectly visible at a distance in slightly turbulent water and something I knew I could see for the length of the trot which could be up to the 20-30m range. I fished this bulk shotted with an olivette locked into place with some smaller shot that could be slid easily up or down the line to use as droppers. The pace on the inside together with the distance I was trotting made rod choice easy, the Cadence CR10 16Ft Match #2 would be bang on. The length meant I could trot off the rod tip on the inside of the crease and also keep as much line as possible off the water at range to keep the float on course and present the bait as naturally as possible. The shape of the float is such that it has a very pronounced shoulder on it which is perfect for periodically holding back in the current to let the bait waft up naturally. To further aid presentation and line control I opted for a centrepin reel, and this was loaded with 4lb Dave Harrell Pro Float line. I started the session trotting a single maggot on a size 20 Drennan Red Maggot Carp hook. The first hour produced no action whatsoever, and I was beginning to become despondent and wondered if the chub had moved elsewhere. I felt there must be some fish around and I started tinkering with depth and shotting patterns until finally, the float buried and I was into my first fish… a minnow! This lifted my spirits and saved me from a blank session, so I was straight back in and then caught a string of minnows and roach. Bites were still sporadic, and I felt I should be catching more fish. So I changed to a double maggot on a size 18 Drennan Wide Gape Carp hook, slid the olivette up the line about two feet from the hook with no dropper shot and the next trot through I hooked into something which jammed the line solid. I held the rod steady and admired its long gradual curve and prayed it was a chub on the other end and not a snag. Finally, there was the classic nod on the rod tip as the fish realised it was hooked and the fight began. Playing big chub on light tackle in a strong current is about patience. The option to bully the fish isn’t there, and sometimes there’s nothing you can do but hold the fish and wait for it to swim upstream. This is where the rod can prove its worth and win the day. With a progressive action, the CR10 16Ft #2 did an outstanding job of absorbing the chub’s sudden lunges, and head shakes, minimising the risk of the delicate end tackle snapping or the small hook straightening out or losing its hold in the chub’s cavernous mouth. The rod did an outstanding job, and after a few minutes my first chub was in the net, and at 4lb 12oz it was a new Stour personal best. 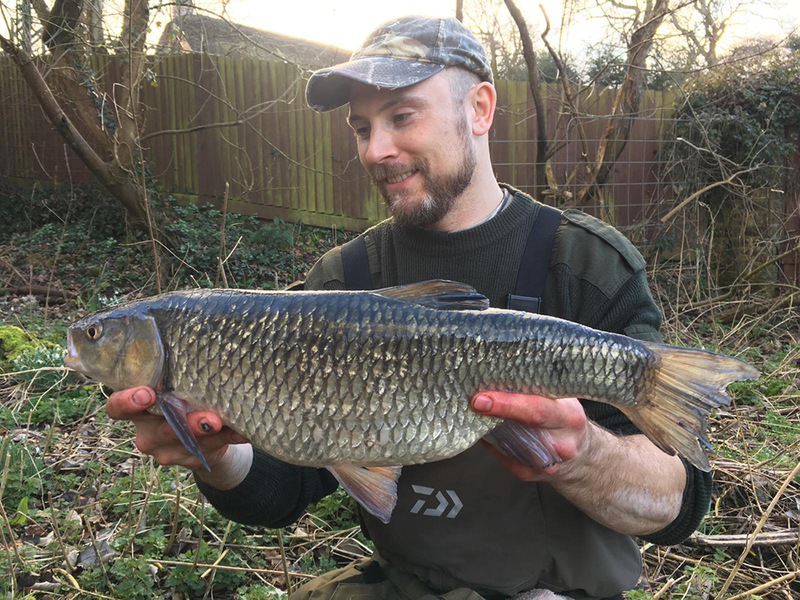 I kept the bait going in through the fight and while weighing the fish and managed two more chub in fairly quick succession (3lb 11oz and 4lb 11oz). Bites then dried up, so it was time to tinker again and find a different depth or presentation to tempt more fish. I switched then to a neat little size 20 Guru F1 Pellet hook pre-tied to 0.11mm line and a single maggot. Next trot I hooked into something much higher up the peg than the previous fish, and I assumed it must be a snag. However, I held the rod steady and hoped it was a fish. After a few seconds, I felt the tell-tale heavy nodding, and I knew I was into a big fish. Again I let the rod do all the work and used its length to guide the fish away from the near bank and into the slower water mid-river. The chub didn’t go on any manic dashes or tear line off the reel, it just plodded and let the current do the fighting for it. After a long tussle, I managed to bring the fish to the surface upstream of my position and used the current to my advantage this time, letting the fish drift down safely into my waiting landing net. 5lb 7oz and my second PB of the day! After another 20mins of heavy and consistent feeding, I hooked and landed a 4lb 11oz chub. This was a fish I recognised (by its mouth deformity and split left pectoral fin) as being a fish caught the day before from the same swim on a trotted red maggot. Shortly after this fish, my friend arrived to watch. As we chatted and enjoyed a good catch up, we both watched the float disappear and witnessed the rod curve heroically as the hook set into something a little bit special. The fish didn’t really budge and just stayed very deep, inching left and right in the heavy flow. Very slowly I managed to encourage it upstream with gentle pressure and delicate winding, and it seemed the fish was willing to listen to my side of the argument. Sadly it seemed the fish was rather unimpressed with my point of view and decided to show me who was in control, charging off downstream and retreating ten yards past where I hooked it. The fish made its point well, and I wasn’t too arrogant not to appreciate what it was telling me. I accepted that the pains in my right shoulder and wrist were not going to be alleviated any time soon. My friend offered words of encouragement and reminded me of the lack of snags in the peg. With continued pressure, I was able to start gaining line, and it wasn’t long before my friend saw the fish just below the surface at his feet. I was jabbering on about some previous fishing incident, and he abruptly told me to, ‘Concentrate on the fight, you want this one in the net.’ When someone who has fished the venue for years (and has had numerous 7lb+ chub and a personal best of 7lb 11oz grace his net) tells you to concentrate you know you’re playing a fish you don’t want to lose! This entry was posted in Fishing Reports and tagged CR10 16ft Match #2. Bookmark the permalink.